One of the best kept secrets of our political system is this: Government support for ordinary people shows up in budgets as a payment. Government support for the wealthy, the super rich and large corporations does not show up in budgets. It is hidden in tax law. So "welfare" for ordinary people is visible and discussed, while "welfare" for the wealthy and corporations are invisible to most people and ignored by the media. An examination of recent changes to the age pension gives a perfect illustration of the way the government and our "free press" focus attention on some issues while managing to ignore the proverbial elephant in the room. The recent changes to the age pension accepted by the Senate are the result of careful preparation. When the LNP planned the 2013 election they knew what most people wanted to hear: No cuts to health, education, pensions or SBS and the ABC. But they also knew they were going to cut funding to all of these things. What answer would they give to the "broken promises" criticism? They developed a wonderful scare campaign: Australia faced an imminent financial disaster hidden by Labor! Government debt was too high, and this would destroy Australia's future! As soon as the Abbott government took office they said again and again that Australia's debt was too high and disaster was just around the corner. They set up an "audit" of government finances. In the business world an audit reveals the financial health of a firm. However this audit was special because it only looked at the expenditure of the Federal Government. The question asked was: Where can we spend less money and avert disaster? Nobody would run a business in this way. In a real audit one would look at expenditure and income to assess a firm's financial health. Any business that was unconcerned with income would soon be bankrupt. But for government, income derives from taxes, and the LNP did not want to increase taxes. Still, the fear of massive debt did not work well for the LNP. Many of the proposed cuts in the 2014 budget did not pass the Senate and the world did not come to an end. In fact, there never was a serious problem of the Australian Government accumulating a massive debt. Australia’s level of government debt is one of the lowest in the West. In fact the LNP government themselves increased the level of Australia's debt, but somehow the “fear of debt” message dropped out of the media. The LNP have given no account of how the big problem of 2014 was fixed. They just don't talk about it any more. On cue the Australian Council of Social Services (ACOSS) came up with an alternative to the draconian cuts to the age pension in the 2014 budget. They propose a "compromise" which takes the pension from those rich people who don't deserve it, and gives more money to poorer people who do. Further, this new plan will save the government 2.4 billion dollars. Suddenly the new leaders of the Greens say this new plan for cuts to the age pension is a fair proposal, much better than the cuts in the 2014 budget. Almost overnight the ACOSS plan became law. These changes allow 170,000 people to have more pension but reduce the pension or remove it completely from 362,523 pensioners. (2) The majority of pensioners stay the same. Most media outlets consider these changes fair. But are they really fair, or are they just a fig leaf to cover a grossly unfair approach to funding retirement for older Australians? One group that was not impressed was National Seniors Australia. They are a consumer lobby for older Australians founded in 1976 with 200,000 members and 140 branches around Australia. Their assessment is that the LNP and the Greens "turned their backs on middle Australia". Their blog not only explains how asset test changes would penalise savers who do not have access to tax-advantaged superannuation, they recognize "these cuts have been sold to the public on the pretext of ending welfare to millionaire retirees in Sydney harbour homes.”(3) Perhaps these comments have not been covered in the media because they are not supportive of the LNP push for austerity at any cost. Since these changes have not been "grandfathered", that is not applied to people now getting the age pension, it means the rules of the system people have used to plan their retirement have been suddenly changed without notice. This will set a precedent for implementing other changes to the system without warning in the future. Here are some serious consequences for people now on pensions and for those who will reach retirement age in the future. DO THE CHANGES TARGET MILLIONAIRES? The LNP and the Greens insist the changes will give $30 per week more to some age pensioners. However it will also take the pension from many others, and the changes will force these people to either live below the poverty line, since they no longer get the pension, or make them live off the capital, not the income of their savings. However the Greens do not accept this as a problem. In their "Fact Sheet" on the changes, the Greens claim it is a "myth" that some pensioners will lose $8000. This is not actually a myth at all, and they admit it with their reply to this claim. "These are people who both own their own home and have at least than $550,000 (half a million!) in assets as well. "(5) The sentiment is clear: These people will loose $8,000 but they are "rich" and can easily afford it. They are so wealthy they don't really need the age pension. To many people, and the person who wrote this "fact sheet", assets of $550,000 seem like a huge amount of money. The reality for pensioners is rather different, and this is why National Seniors and the Australian Institute of Superannuation Trustees are both critical of the new proposals. They understand the needs of the large number of ordinary Australians who rely on superannuation and the age pension in their retirement. First, this $550,000 asset is for two people, a couple. Second, for retired people, such an asset is used to generate income, and not all of the asset can be used to generate income. In his calculations Vince O'Grady assumes that 75% of an asset will generate income. (6) As a benchmark to assess these changes for a pensioner couple we can use the poverty line of $600 per week, or $31,200 per year. This is 50% of the median income in Australia. Notice that there are no changes for the very wealthy or those with few assets. This is why National Seniors stated that the LNP and the Greens "turned their backs on middle Australia". BUT THESE PENSIONERS HAVE SUCH HUGE ASSETS! One could say: "Well, they can just take more money from their assets/investments to make up the difference." But this totally changes the present retirement system. People save for retirement to use their investments/savings as an income stream from interest earned. Some cash might be taken out to pay for medical expenses which rise dramatically for people as they get older. Some might also be used for nursing home accommodation. In addition to these contingencies, these investments have unpredictable rates of return. Now they are very low, and they can disappear into thin air with dramatic movements in world markets. Super funds were hit dramatically by the Global Financial Crisis in 2007 and more could be on the way. Money in such investments is not like cash under the bed, and it is certainly not "safe as houses". In effect the changes are an attack on the living standards for ordinary people who have been able to own their home and manage to save for their retirement. Their assets are intended as a buffer to protect themselves from the things we know life throws at us. The government (and the Greens) want these people to use this money for ordinary living expenses, which are rising, and the smaller their assets become, the more vulnerable they are. Industry Super Australia and Rice Warner have produced a model for retirement and superannuantion which we will examine below. It shows that the number of new retirees affected by the proposed changes will more than double from one in three retirees today, to around seven in 10 by 2055. "The impacts of these changes are very significant for most of the working population. Executed in isolation they will reduce retirement incomes of middle income earners, not the well-heeled," said ISA chief executive, David Whiteley. DID THE GOVERNMENT CLOSE THE $500M FAT CAT PENSION LOOPHOLE? However if you look at the comments by chief executive of Industry Super Australia, David Whiteley, it is hard to believe they are talking about the same thing: "The impacts of these changes are very significant for most of the working population. "(14) How can they be so different? Because the comments by Simon Benson (and the Greens) are LNP inspired spin, while the comments by David Whiteley are from a person who actually knows how our pension/superannuation system works and wants to explain it to us. 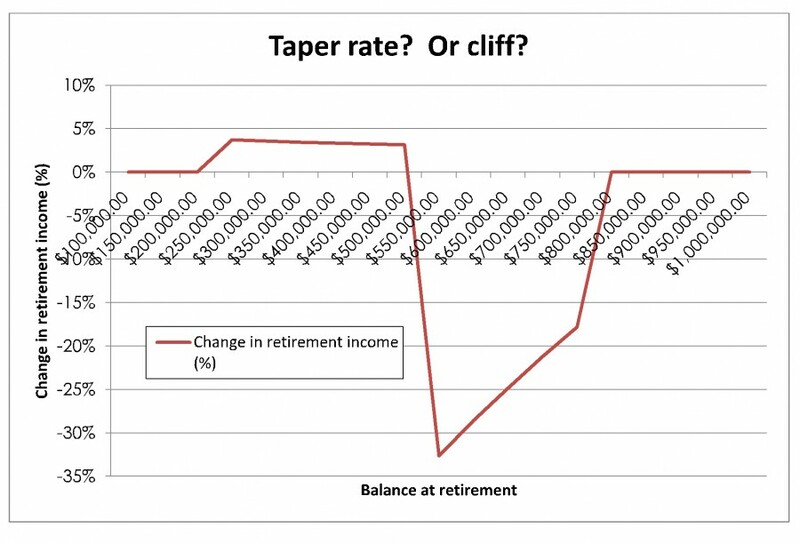 Notice that on the graph entitled "Taper rate? Or cliff?" there are no changes for people with assets over $850,000. So they are not "fat cats"? The government and most media outlets mindlessly repeated the claim that the age pension changes in the 2015 budget were aimed at wealthy "fat cats" who rorted a loophole in the age pension. Simon Bension particularly attacked those with state and federally funded defined benefit pensions while also drawing income from their taxpayer-funded superannuation. But does it really matter who paid for the superannuation? 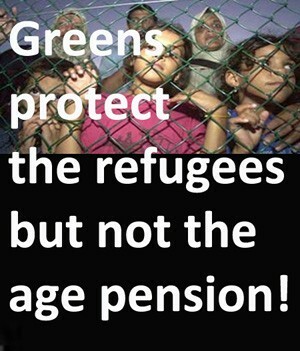 Consider the "millionaires" with assets of $550,000 discussed by the Greens. Without the top-up from the age pension, their income will fall below the poverty line and they will face a decline in living standards. We have seen that the people who work for Industry Super Australia and the Australian Institute of Superannuation Trustees have pointed out that these cuts do not hit wealthy fat cats but middle income earners, middle to low income workers earning average wages of $75,000 or below, that is most of the working population. The "talk" about attacking "fat cats" is just like the pre-election promise not to cut pensions, a diversion to distract attention from the real goals of the LNP, reducing wages and living standards for most of the population. However, since they started talking about "loopholes" and "rorts", let us look at the way superannuation works for the top 20% of the Australian population. The elephant in the age pension room are the SUPERANNUATION TAX CONCESSIONS. 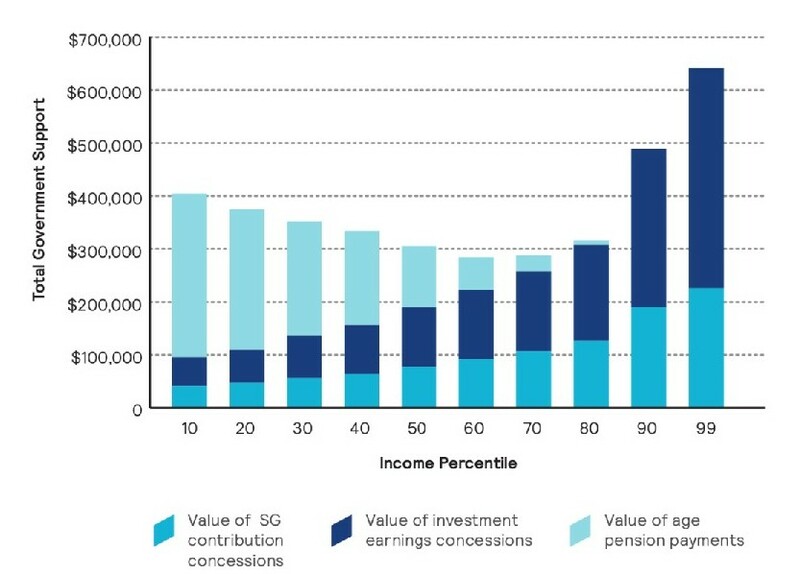 The benefits of these concessions flow to the upper income groups who will not feel the cuts to their superannuation benefits from the 2015 budget that almost everyone else has. There are several different ways to understand how the “welfare for the rich” works. In an interview John Hewson compared the cost of the pension for older Australians seen in the budget with the cost to taxpayers of the taxes that are not collected on investments in superannuation. Remember most older Australians do not have nearly as much money invested in superannuation as the wealthiest 20%. "ELIZABETH JACKSON: So how costly then are superannuation tax concessions in comparison to aged pension costs? "JOHN HEWSON: They're roughly the same. The figures we're using is sort of $44.8 billion for the aged pension and $44.9 billion for the superannuation concessions but the superannuation concessions are rising faster. Thus one way to see the elephant in the age pension room is to realize that taxes not collected on superannuation investments are about the same as to total cost of the age pension and soon will be higher. If you say you want to "balance the budget", why not look at the tax = income side of the budget as well as the payments? John Hewson also presented another way to look at the imbalance in the pension/superannuation system. In other words, it costs about twice as much for people on lower incomes to accumulate $100 in a pension account as it does for people on high incomes. Since tax concessions for wealthy Australians are so generous, low income earners are actually penalised in terms of preparing for their superannuation. And Joe Hockey complains that the amount spend on age pensions is so high? 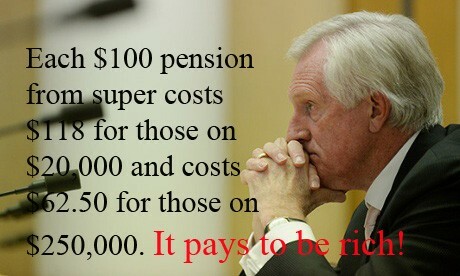 If ordinary people had more superannuation, they could live well with less tax spend on their pensions. This is not the way the government wants you to see the retirement and superannuation system because the this model does not just focus on the payments presented in the budget. The AIST Mercer model looks at three separate elements of government policy at the same time. These three are the value of the government concessions related to the compulsory superannuation contributions made by people earning income. The second is the value of the investment earnings concession which are made in the way these are taxed. The third is the value of the age pension paid by the government and recorded in the budget. It shows the level of government support and what form it takes. Across the bottom of the graph are the income percentiles for Australians. For statistical purposes, this model divides people in Australia into ten groups called deciles which have roughly the same earned income. The number '10' stands for the people who belong to the one tenth of the population with the lowest level of earned income, which falls in the range from $37,856-$43,264. The number '20' stands for the people who belong to the one tenth of the population with an income just above the lowest one-tenth, which falls in the range of $43,264-$49,754. The table below shows the income ranges for each group. WHAT DOES THE GRAPH SHOW?? As one might expect, the highest level of direct payments in the form of the age pension goes to the people with the lowest income levels, and it declines as the income levels rise. But the most interesting fact this graph reveals is that the people with the highest income levels of $125,898 and above get more support from government policies than the lowest 10%. Those at the lowest income levels get $404,000 support over their lifetime, while those at the highest levels get $489,000 or $641,000 if they are in the top 1%. The AIST "Response to Tax Discussion Paper" also shows that the changes to the asset test introduced in 2015 budget have reduced the level of support for all but the highest income levels. Notice that this is not a table of assets for each group. It is a table which shows the difference in the level of government support for each group between the current system and the new system which starts in 2016. The age pension and rules for superannuation and relevant forms of taxation are quite complex. However it is totally misleading to say that the recent changes to the age pension were necessary to stop millionaires from getting a level of support from the age pension that they did not deserve. The people who had their pensions cut are older Australians who had modest levels in income during their lives and managed to save what they could have reasonably thought was an adequate level of superannuation. It seems clear that the changes reduce the level government support for median income earners, not those who make up the most wealthy people in Australia. Some of these conclusions are based on models provided by Vince O’Grady and the AIST Mercer Super Tracker. They may be imperfect, but will the LNP come clean and give a better account from Treasury information? 18. The AIST Super Tracker is based on the Melbourne Mercer Global Pension Index which compares retirement income systems in 25 countries using international data and responses from Mercer consultants based in each country. http://www.mercer.com.au/content/dam/mercer/attachments/asia-pacific/australia/insights/AIST-Mercer-Super-Tracker.pdf/Aist-Mercer-Super-tracker.pdf, page 7. 20. https://www.aist.asn.au/media/14792/20150602_submission_tax_taxwhitepaper%20v1.1%20FINAL.pdf, page; page 19.